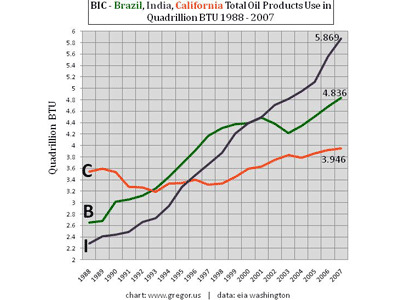 The chart shows total oil product use for Brazil, India, and California in quadrillion BTU. Oil products are best measured in BTU–not barrels–as it strips out the vagaries of different products like Jet Fuel, Gasoline, Diesel, and Heating Oil. Also, BTU can be a better way to compare countries that import barrels, with states that generally import oil products. Here, I wanted to compare California with fast growing Brazil and India over a 20 year period. The trajectories are fairly unsurprising. Fuel efficiency standards have helped to keep California consumption relatively in check, in its path from 3.543 quadrillion BTU in 1988 to 2007’s 3.946 quadrillion BTU. With regards to Brazil and India, a friend chatting to me from China tonight remarked that Brazil’s consumption growth might have been somewhat restrained by its ethanol program. If that’s true, it’s intriguing to conjecture what Brazil’s demand would look like without ethanol’s roughly 17% contribution to total Brazilian liquid fuel use. And in regards to India, one can’t help but note the big spike from 2004 -2007 as demand moved from 4.950 to 5.869 quadrillion BTU and not recall India’s push to complete their Quadrilateral Highway. An ongoing project of mine relates to per capita consumption of energy in the developing world–yet another difficult area where data can be hard to secure on a current basis. There are a number of issues at play on that topic. Not least of which is the very different marginal utility of liquid energy in the developing world, compared to the developed world. As I look at today’s chart, however, I am struck by something simpler: the differences in population. India’s population is 1.139 billion, and Brazil’s 191.9 million. California is lilliputian by comparison, at 36 million. But it’s oil consumption is not. This only confirms my view that we (continue to) underestimate the demand reduction for oil that’s inevitable in the developed world, and the awesome potential for further demand increases in the developing world.